We are a leading Manufacturer of mezzanine floor, industrial mezzanine floor, staircase mezzanine floor, modular mezzanines, storage mezzanine floors and warehouse mezzanines from New Delhi, India. 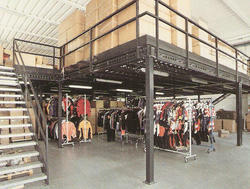 We are offering Mezzanine Floor and modular mezzanine floor systems. Now you can fully utilize existing overhead space and gain valuable working, office, storage or manufacturing areas at a lower cost than new construction. Also, you are able to put this space to work fast, with minimal interruption to your working floor area. We are successfully delivering our Industrial mezzanine floor to all over India .Our products are manufactured by using the finest raw material and expertise supervision. 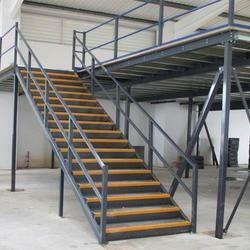 We are well known for our Staircase Mezzanine Floor .These floors are designed and assembled as per the industry specifications, so that maximum safety and utility could be provided to our prospects. Competitively priced, these floorings are designed with the accuracy and efficiency. The Modular Mezzanines Manufacturers are ideal to optimize the utilization of space in ware houses and we manufacture them according to ISO standards. They are used to divide the shelves into a number of segments, thereby increasing storage space. They are made using good quality materials that are long lasting and robust in construction and easy to maintain and repair. They are available according to customer requirements and our customers appreciate them a lot. 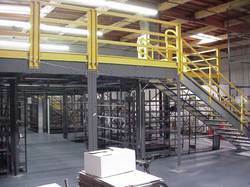 Our Warehouse Mezzanines most popular flooring solution which provides semi permanent storage solution and also is the best way to utilize room height. 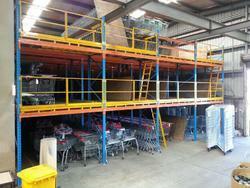 These mezzanine floors structures are usually free standing and in most cases can be dismantled and relocated. We use high quality mild steel to fabricate mezzanine structures.The mezzanine is often used in Factories and similar spaces for storage of tools, raw materials or finished goods. The high roof of the room is ideal for a mezzanine, and offices can be put either below or above it. 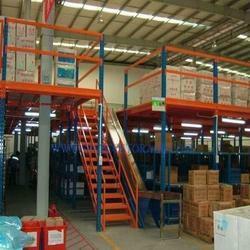 Mezzanines are frequently used in industrial operations such as warehousing, distribution or manufacturing. These facilities have high ceilings, allowing unutilized space to be utilized within the vertical cube. 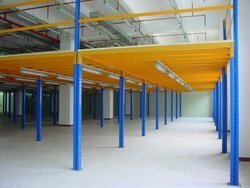 Industrial mezzanine structures are typically either structural, rack-supported, or shelf-supported, allowing high density storage within the mezzanine structure.